Posted on August 13, 2018 at 3:06 pm. Jessica Kwong of Newsweek discusses our new book, The Constitution Demands It, and the case for beginning impeachment proceedings against the President. Click here to pre-order your copy of The Constitution Demands It! Posted on August 3, 2018 at 6:28 pm. Alyssa Milano, actress and activist, penned a letter to our supporters calling on Congress to immediately begin impeachment proceedings against the President. The President’s policy of separating immigrant children is yet another gross violation of the Constitution on top of many other abuses of power. Ms. Milano recommends our new book, The Constitution Demands It, to learn more about the legal case for impeachment proceedings and maximize pressure on Congress to begin an impeachment investigation. Thank you, Ms. Milano! Read the full letter, below. The harm that Donald Trump is inflicting on innocent children by separating them from their families at the border isn’t just morally repugnant — it’s unconstitutional and an impeachable offense. These children — these precious children — are protected by the Due Process Clause of the Fifth Amendment and the prohibitions against “cruel and unusual punishment” in the Eighth Amendment as soon as they are on U.S. soil. THE CONSTITUTION DEMANDS IT: The Case for the Impeachment of Donald Trump clearly lays out the ways in which Trump has violated the Constitution (over and over again) and why impeachment proceedings against him aren’t just justifiable — they’re necessary. If we don’t stop him, Donald Trump will continue to degrade and violate our Constitution at the expense of all of us, but especially the most innocent and vulnerable among us. We must educate ourselves and accept nothing less than swift and appropriate action from our elected officials in Congress. Read this book — it’s smart, informed, and accessible — and then join me in demanding impeachment proceedings against this President. Click here to purchase your copy of The Constitution Demands It! Groups to IRS: Investigate Trump Foundation Now! Posted on July 31, 2018 at 9:21 pm. On July 27, 2018, Free Speech For People joined with over a dozen public interest groups to urge the Internal Revenue Service to pursue an investigation of the Trump Foundation for possible criminal acts. Click here to download the letter issued to the IRS. What Does The First Russia Investigation Case Mean For Trump? Posted on July 25, 2018 at 4:33 pm. Ben Clements, Board Chair of Free Speech For People, and William Weinreb, former acting U.S attorney, join Jim Braude on WGBH: Greater Boston to discuss the upcoming trial of former Donald Trump campaign chairman Paul Manafort and the impact of the first case of the Russia investigation on Trump. Posted on July 19, 2018 at 5:38 pm. In an op-ed for the Huffington Post, Free Speech For People Legal Director Ron Fein challenges the notion that launching impeachment proceedings against Donald Trump must wait until the conclusion of the investigation conducted by special counsel Robert Mueller. Contrary to a common misunderstanding, impeachment does not require evidence that the president committed a federal crime. While senators will be right to question whether Kavanaugh would cast the deciding vote to protect Trump from prosecution, Americans must not surrender an important constitutional safeguard against a president’s non-criminal abuse of power. The fact that Trump has committed impeachable offenses that are not crimes has been lost in our current public discussion, which misleadingly speaks of impeachment as either a prerequisite to or a consequence for a finding of criminal violations. This narrow framing effectively shrinks the scope of Congress’ impeachment power by ignoring serious but non-criminal offenses like pocketing foreign emoluments and abusing the pardon power. Click here to read the full article on the Huffington Post. Want to learn more about the case for launching impeachment proceedings against Donald Trump? Click here to order a copy of the book, The Constitution Demands It: The Case for the Impeachment of Donald Trump. Ron Fein to the Washington Post: Is it treason? Posted on July 18, 2018 at 9:20 pm. In article for the Washington Post, Free Speech For People Legal Director Ron Fein discusses the Helsinki Summit and President Trump’s response to questioning regarding Russia’s attempts to influence the 2016 election. Click here to read the full article on the Washington Post. 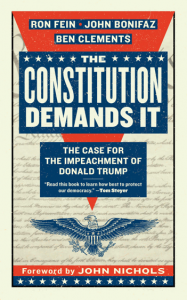 Read more about the case for launching an impeachment investigation of Donald Trump from Ron Fein, John Bonifaz, President of Free Speech For People, and Ben Clements, Board Chair of Free Speech For People, in the new book, The Constitution Demands It. Preorders available now! Posted on July 16, 2018 at 6:56 pm. Free Speech For People and Need To Impeach hosted a Facebook Live event on July 10 to discuss the legal grounds for impeachment proceedings against Donald Trump. The panel featured Free Speech For People Board Chair Ben Clements, Free Speech For People Legal Director Ron Fein, Vermont Law Professor Jennifer Taub and Tom Steyer founder of Need To Impeach. The panel was moderated by Free Speech For People President John Bonifaz. In addition, Free Speech For People announced at the live event the publication of a new book, The Constitution Demands It: The Case for the Impeachment of Donald Trump. To learn more and get a copy of the book today, visit: www.impeachmentproject.org/book. Posted on July 13, 2018 at 3:44 pm. In an opinion editorial for NBC News, Free Speech For People Legal Director, Ron Fein, and Need to Impeach Founder, Tom Steyer, discuss the importance of stopping the confirmation of Brett Kavanaugh to the U.S. Supreme Court until Robert Mueller’s investigation has concluded and Congress has completed an impeachment investigation of Donald Trump. Our objections don’t stem from Kavanaugh’s credentials nor his likely rulings on hot-button issues that divide the American public, such as reproductive rights, voting rights and marriage equality. Rather, the reason that his confirmation hearings must be postponed is much more fundamental: No president should nominate any Supreme Court justice while he is under criminal investigation and facing the prospect of impeachment proceedings. Click here to read the full article on NBC News. Posted on July 9, 2018 at 5:04 pm. We are thrilled to announce the release of our new book, The Constitution Demands It: The Case for the Impeachment of Donald Trump. Written by Free Speech For People Legal Director Ron Fein, Co-Founder and President John Bonifaz, and Chair of the Board of Directors Ben Clements, with a foreword by The Nation’s national affairs correspondent John Nichols, The Constitution Demands It argues that the time to talk about impeachment is now, and offers a precise case against President Trump. And undermining of the freedom of the press. Preorder The Constitution Demands It here. Posted on July 9, 2018 at 5:00 pm. Free Speech For People is proud to launch our new website, the Impeachment Project. The Impeachment Project covers key initiatives we have launched to hold Donald Trump accountable for his abuses of power and to challenge corruption at the highest levels of government. To advance our Divest Trump Soho Campaign to victory. And be sure to check out our newly launched social media channels dedicated to this work on our Facebook and Twitter. Check back here to see all that we have and continue to accomplish together to defend our Constitution and our democracy at this critical time. To learn more about all of our work at Free Speech For people, check out our organizational website here.